Interim Report Third Quarter and First Nine Months of 2014 Allianz Group 55 B Condensed Consolidated Interim Financial Statements 49 Consolidated Balance Sheets 50 Consolidated Income Statements 51 Consolidated Statements of Comprehensive Income 52 Consolidated Statements of Changes in Equity 53 Consolidated Statements of Cash Flows 55 Notes Notes to the Condensed Consolidated Interim Financial Statements General Information 1 – Basis of presentation The condensed consolidated interim financial statements of the ­Allianz Group – comprising the consolidated balance sheets, con- solidated income statements, consolidated statements of compre- hensive income, consolidated statements of changes in equity, con- solidated statements of cash flows and selected explanatory notes – are presented in accordance with the requirements of IAS 34, Interim Financial Reporting, and have been prepared in conformity with International Financial Reporting Standards (IFRS), as adopted under European Union (E.U.) regulations in accordance with § 315a of the German Commercial Code (HGB). IFRS comprise the International Financial Reporting Standards (IFRS), the International Accounting Standards (IAS) and the interpretations developed by the IFRS Inter- pretations Committee (formerly called the IFRIC) or the former Standing Interpretations Committee (SIC). Within these condensed consolidated interim financial state- ments, the ­Allianz Group has applied all IFRS issued by the IASB that are endorsed by the E.U. and are compulsory as of 1 January 2014. For further information please see note 2. For existing and unchanged IFRS, the accounting policies for rec­og­nition, measurement, consolidation and presentation applied in the preparation of the condensed consolidated interim financial statements are consistent with the accounting policies that have been applied in the preparation of the consolidated financial state- ments for the year ended 31 December 2013. These condensed con- solidated interim financial statements should be read in conjunction with the audited consolidated financial statements included in the ­Allianz Group Annual Report 2013. IFRSdonotprovidespecificguidanceconcerningallaspectsofthe recognition and measurement of insurance contracts, reinsurance contracts and investment contracts with discretionary participation features. Therefore, as envisioned in IAS 8, Accounting Policies, Changes in Accounting Estimates and Errors, to those aspects where specific guidance is not provided by IFRS 4, Insurance Contracts, the provisions embodied under accounting principles generally accepted in the United States of America (US GAAP) as at first-time adoption of IFRS 4 on 1 January 2005 have been applied. The condensed consolidated interim financial statements are presented in millions of Euros (€ mn), unless otherwise stated. Due to rounding, numbers presented may not add up precisely to the totals provided and percentages may not precisely reflect the absolute fig- ures. Previously published figures have been adjusted accordingly. 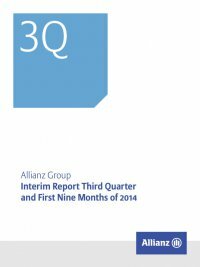 These condensed consolidated interim financial statements of the ­Allianz Group were authorized for issue by the Board of Manage­ ment on 6 November 2014. 2 – Recently adopted accounting pronouncements recently adopted accounting pronouncements effective 1 January 2014 IFRSs 10, 11, 12, Amendments to IAS 27 and 28 – Consolidation As of 1 January 2014, the ­Allianz Group implemented IFRSs 10 and 11 as well as amendments to IAS 27 and IAS 28. IFRS 10, Consolidated Financial Statements, superseded the requirements of IAS 27, Consolidated and Separate Financial State- ments and SIC-12, Consolidation – Special Purpose Entities. IFRS 10 establishes a single control concept as the basis for determining which entities are to be included in the consolidated financial state- ments because they are controlled by the reporting entity. The exis- tence of control is based on the following three elements: −− power over the investee, −− exposure, or rights, to variable returns from the involvement with the investee, and −− the ability to use power over the investee to affect the amount of the investor’s returns.